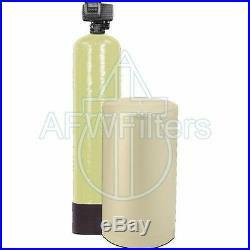 Iron Pro 64k Fine Mesh Water Softener with Fleck 5600SXT. Filter media / resin for tanks. PH Filter / Acid Neutralizers. Abundant Flow Water Systems Inc. Specializes in a full line of water treatment solutions. We provide solutions for residential applications, commercial, and hobbiest. Anything from portable systems and filters, accessories and parts all they way to whole house treatment both point of entry and point of use. Reverse osmosis, water softeners, iron filters, UV filters, and special and custom filter systems. We also do light commercial systems. We believe in providing the quality water you deserve at a price you can afford! Your 100% satisfaction is our number one goal. Abundant Flow Water started in 1998 with a strong belief in upholding Christian values, sharing the love of Jesus, and providing a positive, satisfying customer experience. Member of the Water Quality Association and Better business bureau. AFW Filters 785 735 9769. Regeneration based on water use. Complete System, all in one combination system for hard water, iron, and manganese. Great system, easy to install, easy to use, all automatic, just good clean water! 12"x48" resin tank Riser tube with distributor basket 2 ft. Flow meter measures water and regenerates based on water use, not time, conserving salt and water. 64k (64,000) grain capacity. Of fine resin capable of removing up to 64,000 grains of compensated hardness (hardness factoring in iron and manganese) between regeneration cycles. Specifically designed for treatment of both ferrous (red water) and ferric (clear water) iron, up to a maximum of 8 ppm. Treats a maximum flow rate of 16 gallons per minute. Specially designed resin traps iron and manganense as well as the hardness. Water that has been softened does not form scale buildup on faucets or fixtures or inside pipes. Soft water improves soap efficiency, reducing the amount required for dishes, laundry, and bathing. Maximum efficiency with simple LCD display and touchpad controls for user friendly control. Durable, high quality polyglass tank made by a trusted name it tank manufacturing. Used for holding salt used during the regeneration process. Measures approximately 18"x33" and holds approximately 300 lbs of salt. Simple system connections and detailed installation instructions allow most homeowners to install this system themselves. For those who prefer to leave the work to a professional, most plumbers can install the system in 1-2 hours. Hard water causes a multitude of problems. Scale build-up restricts pipes, builds up on fixtures, and can degrade appliances. Hard water spots are also common on dishes and many other surfaces. The ions that comprise hard water attract soap molecules, requiring more soap to get the job done. This also causes an increase in soap scum and can prevent the removal of dirt and bacteria when bathing. Hard water has also been know to cause hair and skin to be brittle and dry. Iron in your water causes staining and moderate levels can be easily removed with the fine mesh resin used in this system. Automatic regeneration initiated by a high quality Fleck metered head means high efficiency, consistent water treatment, and low maintenance. Soft water will extend the life of your appliances, decrease soap requirements, and decrease the occurrence of soap scum. Softer hair and skin are also common when using water that has been softened. Controlled by the digital Fleck 5600SXT, efficiency and control come together in a user friendly interface. On demand regeneration keeps up with high demands and conserves water and salt when demand is low. This results in consistent treatment and higher efficiency. The simple design allows for installation almost anywhere without being unsightly, and optional tank jackets provided added aesthetics for high visible areas. NOTE: Tank color may vary from the one shown. This system comes complete with a brine tank that includes a float assembly for added reliability and peace of mind. Capable of holding up to 250 lb of salt, the large capacity of this brine tank requires infrequent addition of salt and reduces maintenance. NOTE: Color and design may vary from the system pictured. Simple connections and simple set up make this system great for DIYers. Detailed online installation instructions offer a step-by-step guide on proper installation and set up of the system on installation. 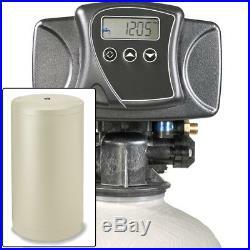 What is a water softener? Eventually the media in the softener (called softening resin) has exchanged all of its sodium or potassium ions, at which point it will no longer be able to remove any more water hardness. This is why the system regenerates. During this process the system runs a brine solution (water and either sodium or potassium chloride) backwards through the softening resin. This concentrated solution forces the trapped calcium and magnesium ions off the resin and down the drain, replacing them with the sodium or potassium ions needed for softening. With the Fleck control heads, this process is automatic, and only as needed! What does the grain capacity mean? Water hardness is usually measured in grains per gallon (GPG). Some places use parts per million [ppm] or milligrams per liter [mg/L]. To convert your ppm or mg/L to GPG simply divide by 17.1 [Example - 200 ppm or mg/L is equal to 200 / 17.1 = 11.7 GPG] The grain capacity of a system is how many grains of hardness your system can remove before it needs regenerated. A 32,000 grain or 32k water softener will remove 32,000 grains of water hardness. From that you can determine how many gallons of water you can go through between regenerations. If you have a 32k softener and your water is 15 GPG hard, you can go through 32,000/15=2,133 gallons of water before your softener is exhausted and needs regenerated. What size system do I need? There are 2 main factors in determining the size you need: water usage and water hardness. Here is a general guideline on sizing your system: 32k system - 1-2 people, average water use and low hardness (under 15 GPG) 48k system - 3-5 people with average water use or moderate hardness (15-45 GPG) 64k system - 5-7 people with average water use or high hardness (45-65 GPG) Service Flow Rate is the maximum amount of water, in gallons per minute (GPM) that a given system can effectively treat. Always size a system based on water usage first, a system undersized for your water usage may not always filter effectively and will wear out faster. Are there systems that don't use salt? Yes, we carry a high quality salt free water conditioner that eliminates hard water problems. Our Scale Sentry system utilizes a specialized media to provide the same benefits a standard softener offers without the use of salt. In addition, beneficial minerals are left in the water and existing scale is removed as well! In our experience our systems outperform other salt free units, including the "magnetic" and electric systems that are widely available. Should I be concerned about the salt a water softener puts in my water? The amount of salt put into your water by a water softener is minimal. In fact, in most cases it is low enough that water ran through a softener is still considered "low-sodium" by the FDA. If you want to avoid adding additional sodium to the water all our water softeners can be used with potassium chloride instead of the traditional sodium chloride. If you want to safe drinking water, our drinking water RO systems can turn your ordinary household water into bottled quality drinking water. What are the differences in the Fleck models 5600, 5600SXT and 7000 control heads? The Fleck 5600 is your basic mechanical control valve. It does it's job in the most cost effective way possible. It is a metered head so it measures how much water you go through and regenerates based water usage. Due to the mechanical limitations on the head it can only be set to 2,100 gallons, at that point it has to regenerate, so some efficiency can be lost depending on the system size and your water hardness. This head is ideal if you are looking for the lowest cost option. The Fleck 5600SXT works similar to the standard 5600 but uses a digital interface instead of a mechanical one. This makes setup easier, and with the digital control it can be set to go through up to 9,999 gallons of water between regenerations. The 5600SXT can be more efficient that the 5600 because of this, especially in larger homes with lower hardness levels. The other advantage the 5600SXT has is adjustable regeneration cycles, while in most cases these settings won't need to be adjusted, with the 5600SXT the option is there should you ever need it. The Fleck 7000 uses controls similar to the 5600SXT, so it is also in that it is a digital head with backlit LCD display, can be set up to 9,999 gallons, and has adjustable regeneration cycles. The 7000 control is designed as a high flow head, capable of flow rates up to 35 GPM, as compared to the 20 GPM of the 5600 & 5600SXT models, so it offers minimal flow reduction in larger homes. Finally, it is a modular design, simply remove the retaining screw and the head slides apart, making any required maintenance or cleaning a breeze! What kind of maintenance does this system require? The only regular maintenance a water softener requires is adding salt to the brine tank, and occasionally cleaning the brine tank. Your satisfaction is our number one goal. So we will do what it takes to make sure you are happy with your order. That starts before the sale and lasts as long as you have your water system. The item "New Iron, Manganese, Water Softener All In One Water Filter System 64k" is in sale since Friday, October 10, 2014. This item is in the category "Home & Garden\Home Improvement\Plumbing & Fixtures\Water Filters". The seller is "factory_direct_savings" and is located in Pfeifer, Kansas. This item can be shipped to United States, Canada, United Kingdom, Denmark, Romania, Slovakia, Bulgaria, Czech republic, Finland, Hungary, Latvia, Lithuania, Malta, Estonia, Australia, Greece, Portugal, Cyprus, Slovenia, Japan, China, Sweden, South Korea, Indonesia, Taiwan, South africa, Thailand, Belgium, France, Hong Kong, Ireland, Netherlands, Poland, Spain, Italy, Germany, Austria, Israel, Mexico, New Zealand, Singapore, Switzerland, Norway, Saudi arabia, Ukraine, United arab emirates, Qatar, Kuwait, Bahrain, Croatia, Malaysia, Brazil, Chile, Colombia, Costa rica, Panama, Trinidad and tobago, Guatemala, Honduras, Jamaica, Bahamas, Viet nam, Uruguay.